The Brewers got off to a hot start, finishing April with a Major League best 20-8 record. They were 6.5 games in front of the second place Cardinals at the end of June. They got to the All-Star break in first place, 10 games over .500. Even though they finished July at 9-16, they still had the second best record in the National league and a 2 game lead over the Cardinals. They finished August in a tie with the Cardinals for the division lead. On September 1, they were in second place after spending the previous 150 days in first place. The Brewers finished the season at 82-80, 8 games behind the Cardinals for the division crown and 6 games behind the Pirates for the second Wild Card spot. The Brewers’ hot start surprised a lot of people. Most of the preseason predictions had the Brewers finishing fourth. In March, many Brewer fans would probably have been okay with a third place finish, staying in the hunt until the last couple weeks of the season. But when the team starts out so hot and stays in first for so long, it is extremely disappointing to miss the playoffs. 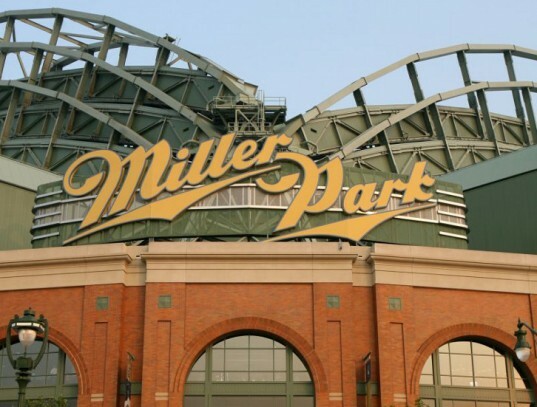 The Brewers sent 4 players to the All-Star Game, including 3 starters. Aramis Ramirez started at third base, Jonathan Lucroy started at catcher, and Carlos Gomez started in left field. Francisco Rodriguez worked around a walk in a scoreless 7th inning. Ramirez went 2-3 with a double and a run scored, and Lucroy went 2-2 with 2 doubles and 2 RBIs. Speaking of Lucroy and doubles, he set a couple of records this season. With his 53 doubles (46 as a catcher, 6 as a first baseman, and 1 as a designated hitter), he became the first catcher to lead his league in doubles. He also broke the record for a primary catcher (47, I. Rodriguez, 1996) and tied the Brewers all-time record (53, Overbay, 2004), as well as breaking the record for doubles as a catcher (45, I. Rodriguez, 1996). The Brewers fate was sealed with a 9 game losing streak starting on August 26. At the time, the Brewers were 73-58 with a 1.5 game lead over the Cardinals. At the end of the streak, they were 73-67 and 4 games behind the Cards. They ended up losing 22 of their final 31 games. It is hard to pinpoint exactly where things went wrong. It seemed that the hitting, pitching, and defense all disappeared at the same time. The starting pitching picked back up, but the hitting and defense never did. Many are calling for Manager Ron Roenicke and General Manager Doug Melvin to be fired. I don’t think that those firings would be the answer. Melvin has built a solid team that is capable of competing year in and year out. Roenicke has done a good job with the teams that he has had, in my opinion at least. What the Brewers need is a vocal leader in the clubhouse. They have plenty of veterans and a good mix of youngsters, but they do not have the one guy that will get in people’s faces. Somebody like that has the ability to stop a losing streak before it hits 9 games. They hold the rest of the team accountable. Lucroy stated that the team got complacent. The Brewers needed a leader that won’t let that happen. Roenicke is not that type of manager, but neither was Harvey Kuenn. The Brewers need somebody to fill the role that Prince Fielder did in 2008. Somebody who is not afraid of confrontation. Whatever the reason, the Brewers had a great 20 weeks followed by a heartbreaking 6 weeks. There is a lot to build on, and they could be better than this year’s team. They just have to keep from having a month-long slump like they did last season in May and this season in September.